On Friday afternoon, the College of the Canyons Interior Design and Architecture departments hosted an Open House at the college’s new ‘Habitat Lounge’ student exhibition area located at the Westfield Valencia Town Center. The Habitat Lounge is a temporary exhibition area operated by students from the COC Interior Design and Architecture departments. Located on Town Center Drive in the heart of the mall, the lounge is dedicated to helping COC students showcase their work and begin to offer their skills and services to interested businesses and community members. In addition, COC students are invited to use the Habitat Lounge’s casual setting as a venue to meet with classmates, form study groups, complete assignments and share ideas and be inspired by each other. Space for the Habitat Lounge was donated by the Westfield Valencia Town Center as a means of helping to promote the various career technical education opportunities available at College of the Canyons. 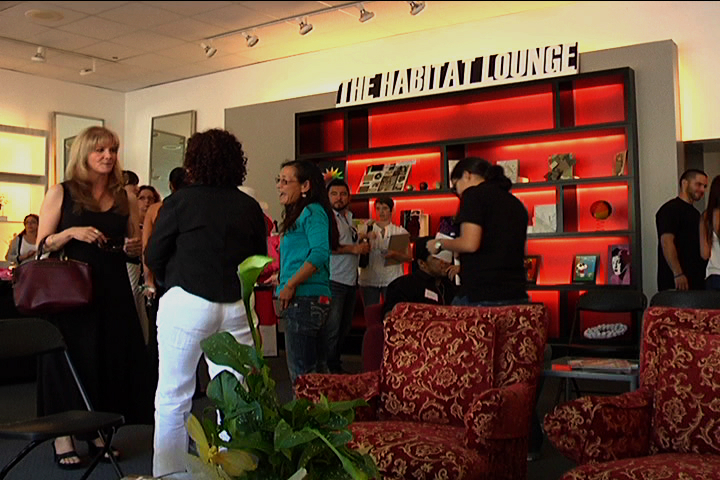 The Habitat Lounge is open from 2 to 8 p.m. Fridays and Saturdays and 2 to 6 p.m. on Sundays.